Apollo 17 astronaut Harrison Schmitt faces the American flag on the lunar surface with Earth in the black sky above, during a moonwalk on Dec. 12, 1972. In the 40 years since NASA's last lunar landing, the moon has had its ups and downs as the target for humanity's next giant leap — but the idea of returning to the moon is on the rise again. Even though President Barack Obama dissed the moon a couple of years ago as a "been there, done that" destination, there's an enduring appeal to our closest celestial neighbor. Part of the appeal comes from planetary science, part of it comes from the moon's potential as a close-in gateway to the solar system — but a big part of it has to do with the moon's hold on our imagination, which took root before the pyramids were built. 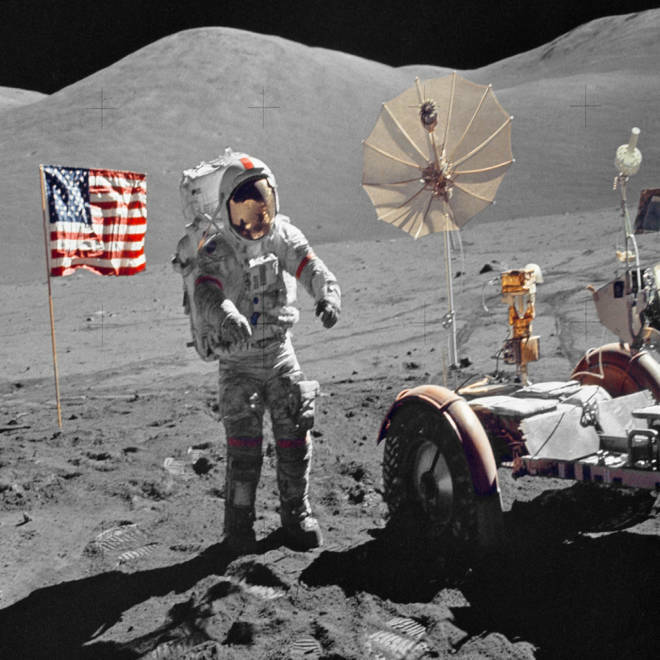 When Apollo 17 touched down on Dec. 11, 1972, marking the final lunar landing of the Apollo program, the moon was the agreed-upon finish line for the Cold War's space race. But now the world has changed, and the case for going to the moon is more complicated. "I've been referring to the moon as the Rodney Dangerfield of the solar system," said Andrew Chaikin, author of "Man on the Moon," the definitive history of the Apollo space program. Two dozen teams are bearing down to try winning the multimillion-dollar Google Lunar X Prize, which goes to the first private venture to send a rover to the moon for a trek to be broadcast on live TV. Two of the teams, Odyssey Moon and SpaceIL, joined forces last month in hopes of taking the grand prize by the end of 2015. Last week, the Golden Spike Company proposed sending two-person expeditions to the moon on a commercial basis for $1.4 billion each — which is more than $100 billion less than what NASA was proposing back in 2005. China and Russia say they want to put their astronauts on the moon sometime after 2020, with or without NASA. As an initial step toward that giant leap, China is planning to send a robotic lander to the lunar surface next year. India also aspires to send spacefliers to the moon someday. NASA has floated the idea of setting up a new space station at a gravitational balance point beyond the far side of the moon, known as Earth-moon L2. The concept is currently stuck in political limbo, however. A report from the National Research Council faulted NASA last week for lacking a solid strategy for space exploration beyond Earth orbit, and said specifically that NASA's plan to visit an asteroid hasn't gotten enough support from international partners, or the American public, or even within the space agency itself. John Logsdon, former director of George Washington University's Space Policy Institute, says Obama's next presidential term could provide the opening for a lunar comeback. "It's certainly in the air here, that changes in the planning for exploration are coming," he said. "There's enough negative pressure that this asteroid goal isn't working, and enough positive pressure to work with the international community that wants to go back to the moon, that the White House will at some point approve the beginnings of a shift in exploration strategy — in which the moon, or at least the space between the earth and the vicinity of the moon, gets a much higher profile." One of the early test missions for NASA's next-generation heavy-lift rocket — the Space Launch System, or SLS — would involve sending an unmanned Orion capsule all the way around the moon and back in the 2017 time frame. The first crewed mission, set for 2021, would put up to four astronauts into lunar orbit. "It could just as well be an initial mission to this Earth-moon L2 location," Logsdon said. In September, NASA Deputy Administrator Lori Garver declared that lunar missions would be part of the agency's grand scheme. "We're going back to the moon, attempting a first-ever mission to send humans to an asteroid and actively developing a plan to take Americans to Mars," she said. Chaikin, who has taken on the back-to-the-moon concept as his next crusade, said lunar missions could serve three purposes. The first aim would be to study the preserved history of the solar system — following up on a scientific story that the Apollo missions were just beginning to uncover. "I really think the moon deserves to be called a Rosetta stone, because it has unlocked our understanding of how we interpret the clues that we see on other worlds," Chaikin said. Just as importantly, the moon serves as an "Outward Bound" school for farther space exploration. If a mission goes wrong, NASA could bring the astronauts back in a matter of days — rather than the weeks that an asteroid mission would involve, or the months required for a trip from Mars. And then there's a phenomenon called the Overview Effect, which could conceivably attract lunar tourists a generation or two from now. "The moon is the only place in the solar system where you can stand on another world and have a consciousness-raising view of Earth," like the view that the Apollo 17 astronauts marveled at 40 years ago, Chaikin explained. But Chaikin also warns against getting bogged down on the moon. That was the problem with the Constellation program. It called for a permanent settlement to be established on the moon in the 2020s. The cost? You don't want to know. Chaikin said it's better to use the moon "to learn about living off-planet" — to learn how to make use of the moon's water, dirt and rocks, for instance — and then move on to Mars. The way Chaikin sees it, Apollo 17 was a beautiful ending to one era. Now it's time for the next one. "Apollo 17 ended the program on a spectacular note," he said. "You can interpret that one of two ways. You can say, wonderful, they found a great way to end it. To some people at NASA, it was just the right time to get out. But on the other hand, here it is, 40 years later, and we're still waiting for someone to pick up where Apollo 17 left off. If we can do that, with the same level of scientific exploration, we'll be in great shape." Click through historic photos from humanity's last trip to the moon, the Apollo 17 mission in 1972.